As part of the world wide Scout movement Scouts have their own uniform. Scouts wear a blue uniform shirt with dark green highlight on the collar and sleeves together with navy blue pants or shorts and a belt. They also wear the blue and black 1st / 14th Brighton Sea Scouts scarf, a woggle and badges. Scouts are "Sun Smart" and need to wear a broad rimmed hat or something similar when participating in any outdoor activities. For most meetings at the Scout Hall and excursions the uniform will be worn. Your Scout section leader will let you know if there are activities, such as one where you might get dirty, where you will wear "mufti" or casual clothes. 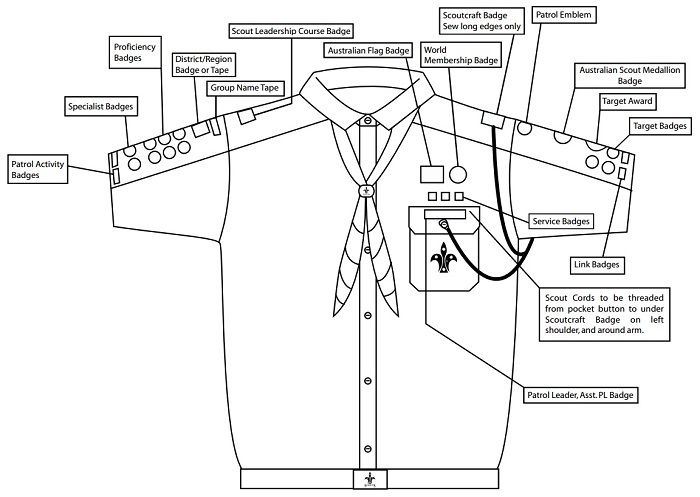 All badges need to be sewn onto the Scouts shirt in specific locations. The diagram below shows the correct placement. The Scoutcraft Badge is the firts badge completed by every new Scout. 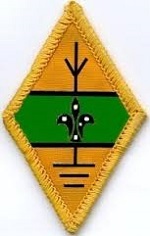 The Scoutcraft Badge is earned within four to six weeks of you joining the Troop. 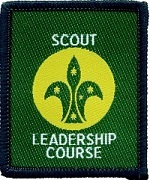 Your Patrol Leader and Scout Leader work together to carry out the training and testing for this badge. There are three levels of Target badges; Pioneer, Explorer and Adventurer. 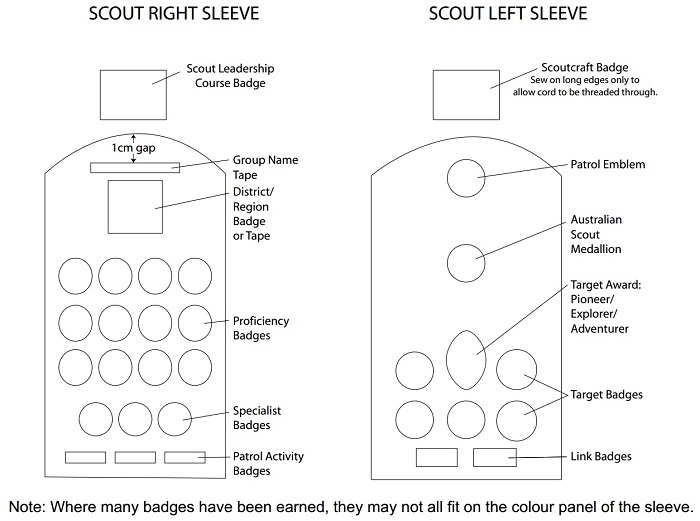 To achieve each level the Scout must complete the two compulsory Campcraft and Citizenship Target badges, plus one of the six elective Target badges at available each level. - The Pioneer Badge (Red) concentrates on participation and learning. - The Explorer Badge (Blue) concentrates on knowledge and skill. - The Adventurer Badge (Green) concentrates on instructing others. The aim of the Proficiency Badge system is to allow the Scout to develop in a challenging and interesting pursuit. To achieve a Proficiency Badge the Scout must fulfil requirements set in conjunction with their Adviser and which include the three elements of demonstrate/investigate, skill and an activity. There are 31 Scout Proficiency Badges. There are nine other badges that may be worn. 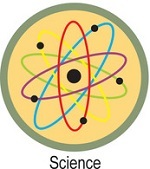 The following five may be used as Proficiency Badges: Amateur Radio Operator Badge, Anchor Badge, Deaf Sign Language Badge, Faith Awareness Badge, Language Emblem. 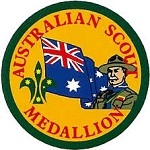 The Patrol Activity Badge is an important part of the Award Scheme. You and your Patrol or Activity Patrol are given a wide choice of interest and skills to pursue in small group activities. These activities are organised and run by you with a minimum of adult involvement. 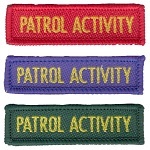 You are required to earn one Patrol Activity Badge for each of the Target levels in order to earn your Cord for that level. While you may earn as many Patrol Activity Badges are you wish, only one for each level is worn on your uniform. - Achieve the Adventurer Cord.